On a trip from Maryland to northern Ohio I wanted to give relatives an idea where I was along my travels. For this I fired up my Argent Data Systems Tracker2 and Kenwood TM-V71A. For the entire drive, I ran the Kenwood at 10W and transmitted on the Automatic Packet Reporting System (APRS) frequency of 144.390 MHz as K8ESR-9. The outcome was much improved over past trips do to better coverage by digis and I-Gates. In previous trips, I could drive an hour and a half without a packet being received at an I-Gate. As can be seen in the aprs.fi plot, this is no longer the case. I'd like to thank the amateur radio community for improving the coverage by adding digis along this heavily traveled route. 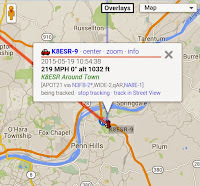 aprs.fi plot of received APRS packets on Ohio and Pennsylvania Turnpikes. As a side finding, I discovered that I do need to look at my setup. 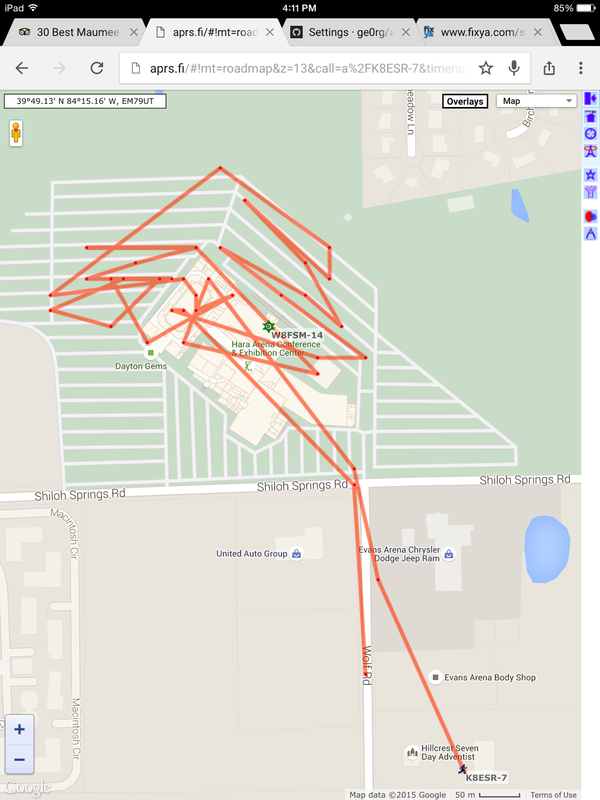 Unless I unknowingly have a car-airplane hybrid then I think there could be an issue with the GPS. At least one transmitted packet shows the speed to be 219 MPH. The elevation at that point checks out but the speed... uhmmmmm, suspect. As always, your results may vary depending on radio and antenna setup but when traveling on this part of the turnpike you'll have decent coverage for most of the drive. Happy travels! At the 2013 Hamvention I picked up a Yaesu VX-8GR which unfortunately Yaesu discontinued when they released the FT-1DR for their System Fusion concept. 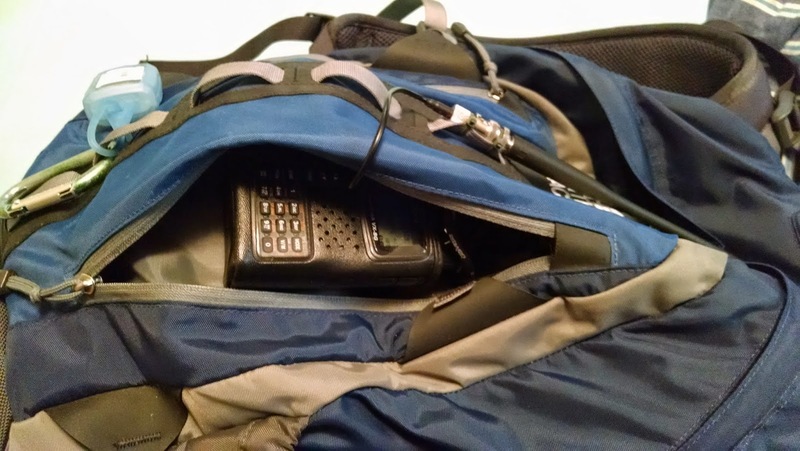 In 2015 I still own the VX-8GR and I decided to use it for my Saturday trip. My primary HT is a Kenwood TH-F6A and to keeps things simple I decided to make my APRS backpack portable. This was a simple build consisting of a backpack, a 3 foot extension cable SMA male to BNC male, BNC female to SMA female adaptor, and tie wraps. I attached the stock antenna to the backpack and ran the extension cable to the side pocket. A nice quick "build" so to speak. 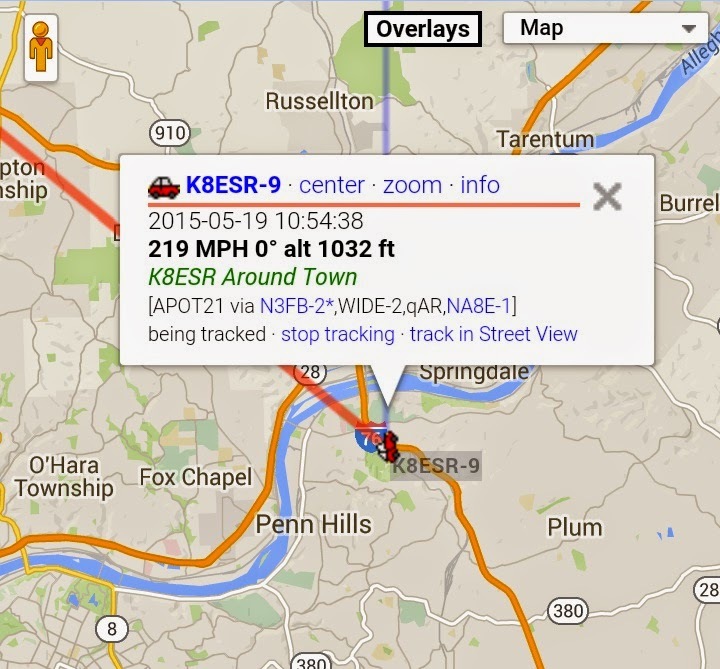 With all of the APRS traffic at Hamvention I was not entirely sure how well this was going to work. I set the HT to transmit at 3 minute intervals and let it go for the day. 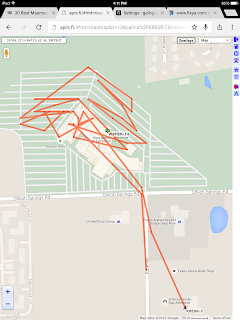 From 9 AM until about 2 PM 39 packets were picked up and available to map in APRS-IS. Yet again, I am impressed with how well this little radio performs in a crowded environment. The GPS has sufficient sensitivity to provide some position packets from within Hara Arena. As you can see, we did a decent job making our way through the flea market on Saturday. So, if you are looking for a good HT with great APRS battery performance (blows the Kenwood TH-D72A away on battery life) I still highly recommend the VX-8GR. These radios are no longer in production so you'd have to pick it up on Ebay or in a flea market. If you do buy one I don't think you will be disappointed. 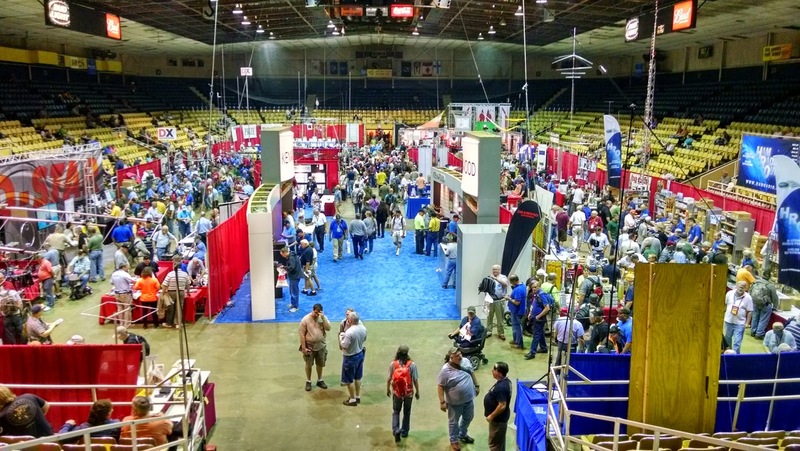 This year marked another great year at Hamvention 2015. Due to the traveling I am usually only able to make one day out of the three day event in Dayton Ohio. As I noted in my past post Hamvention 2015 - Trip to Ohio I was lucky again this year to be able to travel to Dayton with my father, K8RSU. 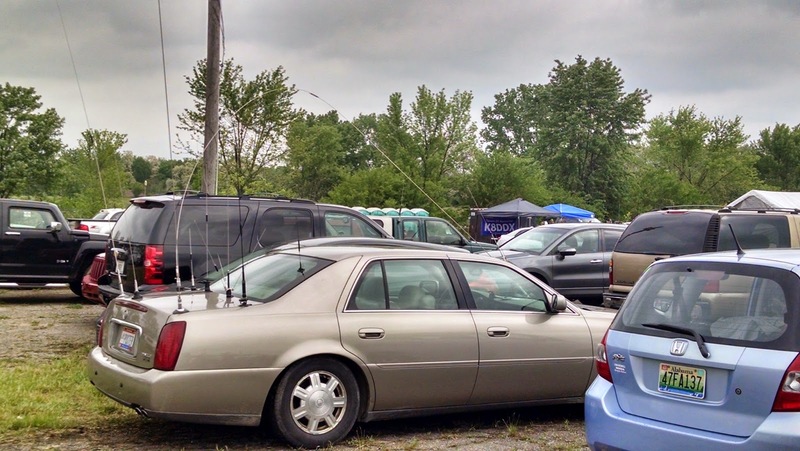 Hara Arena is a great venue for Hamvention so hopefully Hara can resolve its financial problems and continue to be around. 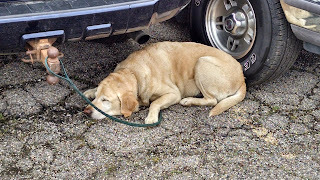 As always, there was a lot of walking involved especially out in the flea market. With the exception of some tie wraps and heat shrink, I didn't find much this year to purchase outside. I did however, capture some different pictures from the Flea Market. 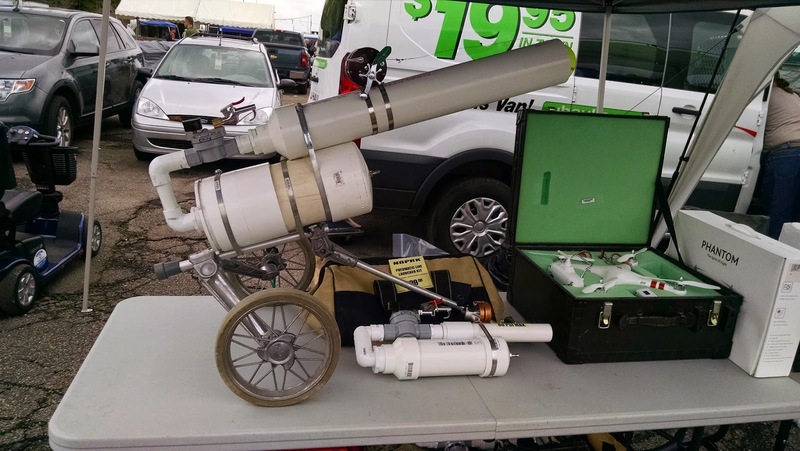 The pneumatic line launcher kit. You could purchase N8PRK's kit for $199.00 (minus the wheels). It has a max PSI of 80 so it probably doesn't have a lot of other uses but this should would be a fun "toy" to own. With my count, this car had 13 antennas. I am not sure how this person gets into their trunk or where they put their radio equipment but the number of antennas is impressive. 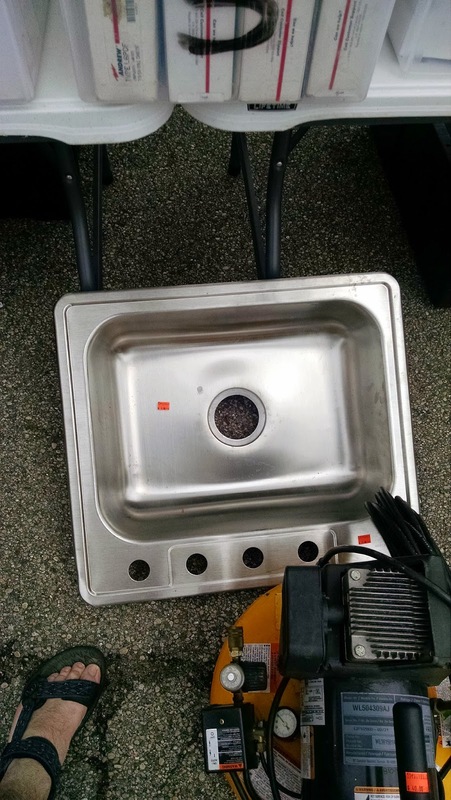 People were selling everything this year from radios and test equipment to the kitchen sink ($5). 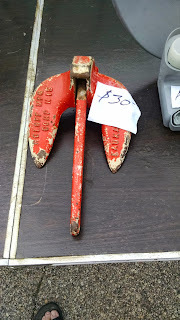 I was also able to locate a boat anchor - a real one! Finally, I found this. It reminds me of my yellow lab. This is a cute little puppy taking a nap. Hopefully my schedule will work out making it possible for me to attend again in 2016. 73's K8ESR. I've lost count but is probably my 14th trip to Hamvention. 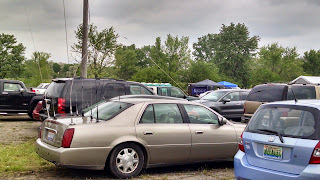 To be honest, I lived in Dayton for 6 years and attended Hamvention three of the years so those where easy trips. Living in Dayton, Hamvention spoiled me on hamfests. Take Hara Arena and pack in equipment manufacturers, retailers, groups, demonstrations, exams, 25,000 (give or take) attendees and you have one large group of great people and equipment - and that doesn't include the flea market in Hara's parking lot! If you look at the map, you can see that it is an extensive layout. After moving away from Dayton I have made an effort to make it back on as many occasions as possible. This year I am lucky to be able to attend again with my father and so far the trip has started out fairly routine. Leave the house in Maryland between 4AM and 5AM, drive 435 miles, and suffer through Ohio Turnpike construction. Unfortunately, I tried to make it to Ohio in time for the 9 AM trivia net outside of Cleveland, Ohio but by the time I made it in range of the repeater the net was about over. Maybe next year. On my drive I always enjoy stopping at the Somerset Plaza on the PA Turnpike. 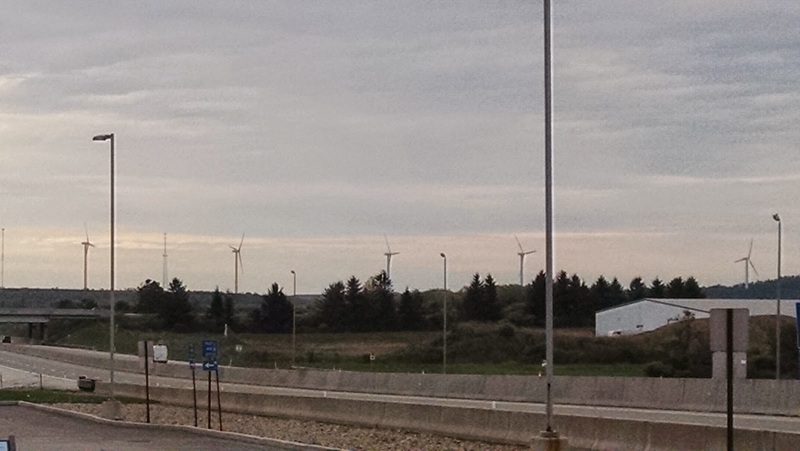 Other than it is a good point to take a break, I like spending a few minutes watching the wind generators. For some reason I just find these peaceful to watch. 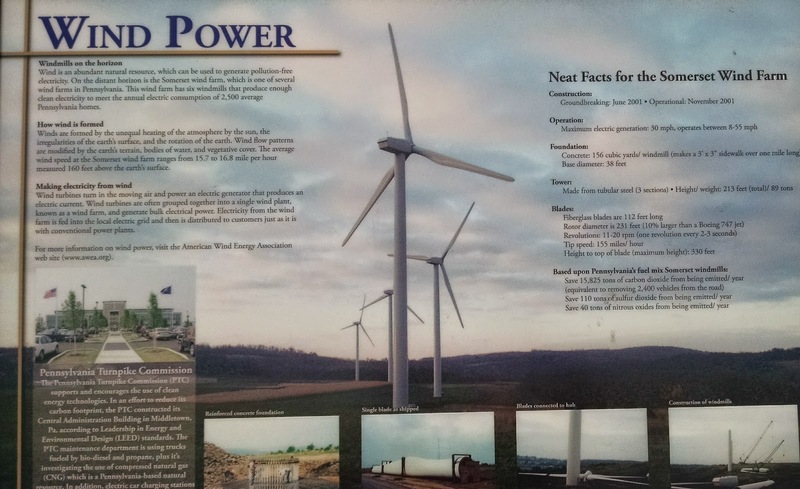 From the plaza you can see a few of them and they have a description of the wind power generation. 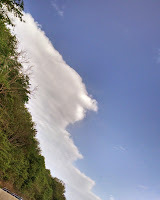 Before I hit the rain in Ohio I did encounter an interesting cloud formation. I don't recall ever seeing one that looked like it has 90 degree or near 90 degree angles. Tomorrow we leave early for Dayton. I'm excited to go but more excited that once again my father and I can do this together.